For my next movement towards being more “GREEN” I’m going to be giving up buying new clothing (aside from underwear) for a whole year. There, I’ve said it…now I feel even more commited. I’ve been giving this “green” commitment some thought for a while now. A year sounds like a long time, but I’ve realized throughout the past months that I certainly have more than I need already in my closets. 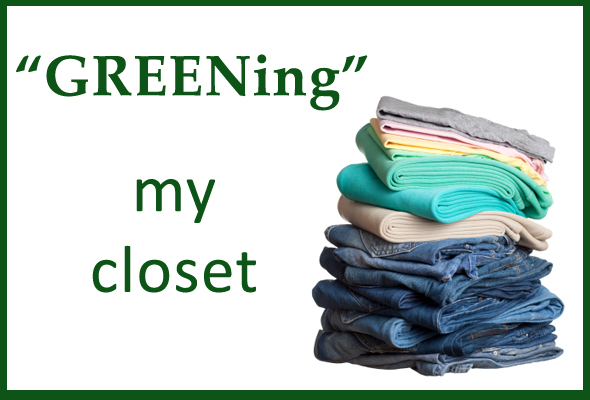 Usually at the change of seasons, I go through my clothing and bring anything I haven’t worn to Goodwill to pass along to someone who might need or want it. I have consistently done this over this past year (since last Fall) and I realize, though I’ve pared down my wardrobe quite a bit, I really have quite a lot still left! At least now I know it’s clothing I will actually wear, not just “stuff” taking up space. Honestly, it’s a really good feeling to not have just excessive “STUFF”! So for the next year, I will only be buy clothing if I need something (and I don’t expect to need anything), and then checking out the second-hand stores for the item first. I’m also hopeful, as I’m not shy at all about taking hand-me-downs, that I will fill the need to have something “new” and different that way. I luckily have some pretty stylish friends who have given me some incredible things in the past – hint, hint Shannon, Kathy, Nia. I’m going to admit, the hardest part of this commitment – which is also why I need to make it – will be giving up buying accessories. I LOVE buying accessories…even inexpensive baubles are just so much fun for me to purchase and to wear. Again, I realize I have plenty – more than enough to get me by – my new mantra. Now, I’m not making this year-long commitment so that in a year I can go “hog-wild” and replace all that I own. What I’m hoping this commitment will bring along for me is a sense of consciousness to all that I purchase. Leading to a “something in/something out” sort of lifestyle and more appreciation for all that I already do have while keeping it to a reasonable level of having just what I need. Have you checked out sites like freecycle, craigslist and ebay before for used clothing before? Any motivation and encouragement would also be very welcome….Thanks and Happy Friday everyone! Oh, wow! I’m not ready for that one yet! But you have all my encouragement about it. Good luck! Thanks Nadia…wow, I hope I can stick to this one…it’s been easy since we’ve been away…but I know the real challenge will be during all the holiday shopping frenzy that is sure to go on around here! Hope all is great with you!! I downloaded the brochure for the Canadian program you are in…it sounds fascinating!! I’m so excited for you…I’ll keep you posted if I contemplate joining you in your studies! I think this is a super project/commitment. I also think a lot of people have too much stuff. It’s good to simplify yout life. Thanks Deb…I really hope I can stick to this…I keep reminding myself that I have WAY more than enough stuff already! !